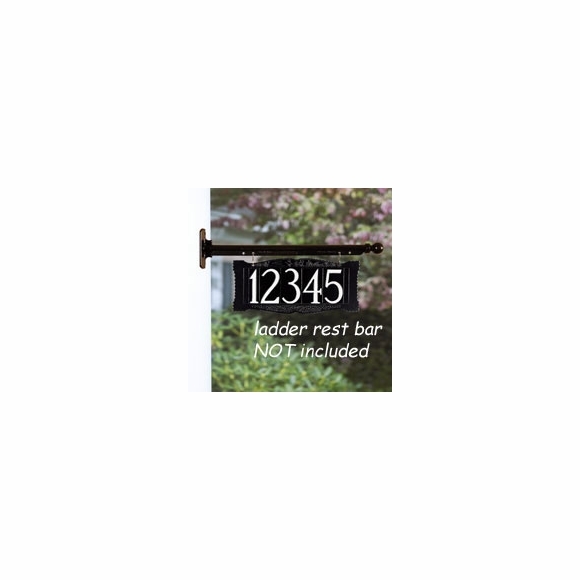 Ladder Rest 4" Number Address Sign - - one line hanging house number sign holds up to five large 4" numbers. Made in USA. Ladder rest sign to hang from your own bar. Two sided address sign can be seen from both sides of the road. Same numbers on front and back. Shown above in black with white reflective numbers for extra visibility. Also available in these color combinations: AB antique brass; AC antique copper; BG black with gold characters; BS black with silver characters; BW black with white characters; GG green with gold characters; OB oil rubbed bronze; OG bronze with gold characters; PS pewter with silver characters; RG red with gold characters; and WG white with gold characters. Personalized house number sign with large 4" numbers. Made in USA.